Brace yourselves, because a massive heatwave is spreading across Queensland this week! 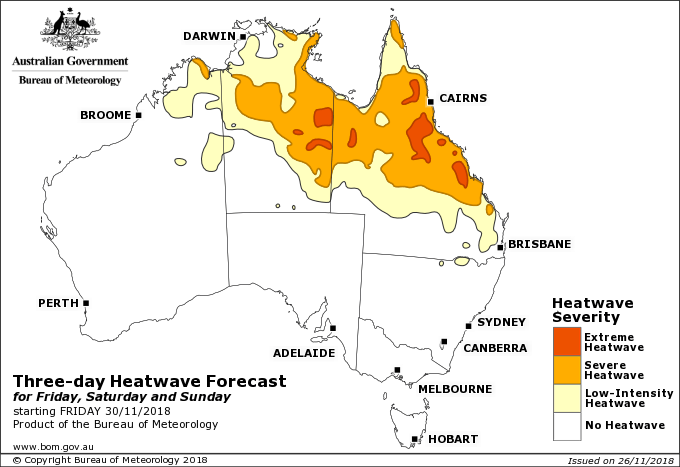 An area of severe to extreme heatwave conditions across northern and central Queensland, with low intensity conditions extending over much of the remainder of northern Queensland. Cairns and Mackay have already recorded their hottest November on record yesterday, with 37.8C around Mackay airport. A Queensland Health spokesperson has urged Queenslanders to take precautions against dehydration and other heat-related conditions, and to be aware of related symptoms including high body temps, headaches, dizziness, nausea, vomiting, dry skin, and fainting. If serious symptoms are evident, residents are encouraged to seek emergency treatment. There’s also other dangers to be aware of through the heatwave, like metal seatbelts that turn into branding irons under the sun, jellyfish, and unattractive tan lines. As far as shark season goes, we unfortunately don’t have a lot of tips, although Underwater Australasia suggests that “the easiest and surest way [to avoid sharks] would be to stay out of the water”… simple but effective. The Baby Shark song (doo doo doo doo) is also known to scare away sharks, although this is yet to be scientifically proven. For more tips on shark-handling, we recommend consulting Mick Fanning. Be sure to let us know your HOT tips for handling the heat in the Facebook comments!